Just days after Nick Diaz's camp criticized the athletic commission in Quebec for their handling of his UFC 158 weigh-in with UFC welterweight champ Georges St-Pierre, another athletic commission is under fire. 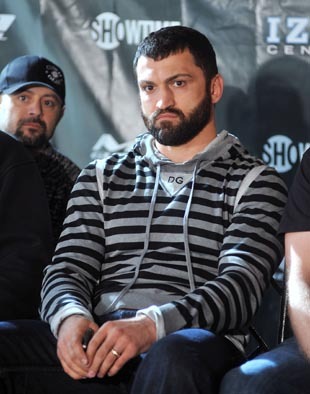 Jackson's MMA, the gym who backs Andrei Arlovski, said a timing error by the New Jersey State Athletic Control Board resulted in Arlovski's broken jaw. The NJ athletic commission was worried about the World Series of Fighting getting a new canvas and new corner pads for the cage they almost canceled the fight Saturday night. Unfortunately they forgot to get a time keeper that was trained properly. 1st round 5min 8 sec in the Andrei fight. A devastating blow was landed after the 5min mark. It's amazing how so much time is spent with over regulating but the simple things can cost dearly. WSOF had to bring in a new canvas and pads when the ones they originally had were unsuitable. But the timing error is much worse. Check out this video via MMA Fighting, and listen to the wood clacking at the 10-second mark. The clock disappears from the screen at seven seconds. Even a generous countdown shows the fight went past the five-minute mark. The worst part is that the damage Johnson caused came after the time should have expired. His jaw was broken, and it needed surgery for repair. It also raises questions on if the fight result would have been different if Arlovski wouldn't have been hurt late in the first round.